Systems and Signals Group: Educated guesses about ancestral shapes and sounds: what do dead languages like Latin and Greek sound like? Educated guesses about ancestral shapes and sounds: what do dead languages like Latin and Greek sound like? What might ancient creatures have looked like? What would dead languages have sounded like? And what are the evolutionary relationships between currently observed shapes and sounds? While we have widely accepted methods that allow us to speculate (in an educated fashion) about ancestral genetic sequences we don't have well developed approaches for shapes and functions. I proposed to John Moriarty that we attempt to extend sequence inference to functions, and we got a grant with some most excellent colleagues John Aston, Dorothy Buck and Vincent Macaulay. John and I wrote a paper in which we investigated this using the versatile mathematical tools that are Gaussian Processes. We showed that in some controlled settings we could take (functional) observations from the world and make sensible guesses about what their ancestors might have been. If you want to see a video of us implementing an experiment with the help of some school children then click here (a blog specifically about our school engagement is here). More or less, our task is to take the game of telephone and run it backwards to identify the original sound (a sound can be viewed as a curve, or function on the line, or as, e.g., a spectrogram, a function on the plane). But once you suppose you can reconstruct original sounds from mutated versions then one might hope to engage with some big and old questions: what do dead languages like Latin and Greek sound like? 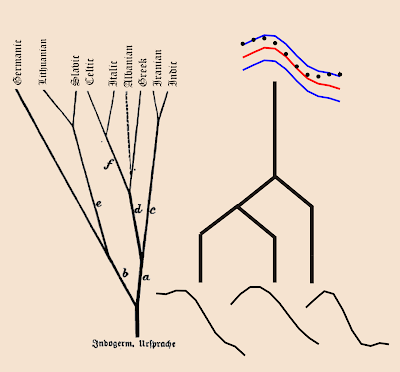 Can we use observations of contemporary speech sounds made at different leaves of linguistic trees (see the picture below) "to put probability distributions over" (make educated guesses about) possible ancestral speech sounds? One takes an audio recording of the same (sufficiently homologous) word in multiple different languages and attempts to make (probabilistic) inferences about the corresponding ancestral sounds. 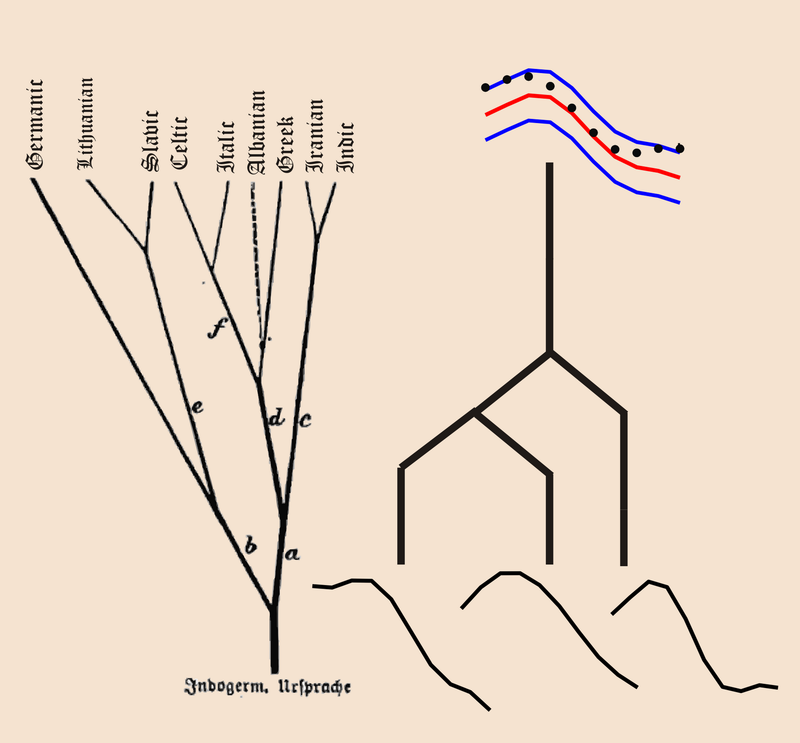 On the left is Schleicher's original tree of Indo-European languages, from 1860. On the right is a numerical experiment where, given knowledge of the three black curves at the bottom and the evolutionary tree (thick black object) we can put a probability distribution over possible ancestral curves and sample from that distribution (red curve is the mean, blue a measure of standard deviation and dotted black is a sample from that distribution).